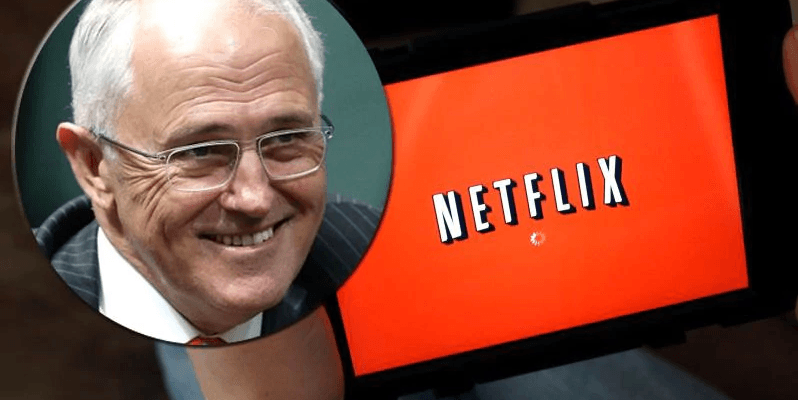 Costs for the Australian Prime Minister’s “Neflix and Chill” sessions is set to rise with the introduction of a Goods and Services Tax (GST) on digital products. Major online retailers including Amazon, eBay and Alibaba have warned that the Australian government’s attempts to apply the 10% GST to all goods and services supplied to Australia over the internet will leave customers worse off. Treasurer Scott Morrison’s announcement of the “Netflix tax” sparked criticism from many internet shoppers as well as the Labor opposition who have labelled the proposed tax collection methods as unworkable. Currently the absence of GST digital imported results in loss revenue for the government. Australian benefits also claim that the lack of GST on foreign products leaves local suppliers at a disadvantage. eBay has warned of the potential ‘geo-blocking’ of Australian customers claiming that it does not have the ability to collect the tax for the government. From July 2017 to 2019, the tax is predicted to net $350 million, which will the government claims will be reinvested into the local economy. The impact on pricing for customers is yet to be known but with Netflix at $8.99 a month would go from $107.99 to $118.60 per year adding an increase of around $10.70. With the “Netflix tax” nearing passage in the Senate and having received commendation from the Economics Legislation Committee, Shadow Assistant Treasurer Andrew Leigh has called on the government to delay the “Netflix tax” until mid-2018 due to its complexity. This post has also appeared in The Typewriter.